Seeds are being sought by organisers of a gardening, food and drink festival to be held in Aden Park next month. Keen gardeners in the North east are being encouraged to collect and save seeds ahead of this year’s Seedy Sunday – a gardening, food and drink festival. The annual event will be held on Sunday, March 18, at Aden Country Park in Mintlaw and will provide locals and visitors with an opportunity to swap surplus plants, exchange seeds, share gardening tips and advice and browse the many stalls selling produce and crafts. 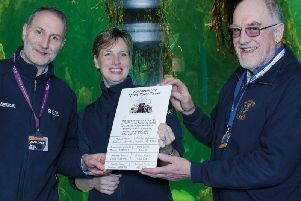 Leona Findlay, development officer at Buchan Development Partnership, organisers of the event along with Friends of Aden and Aberdeenshire Council, said: “This year’s Seedy Sunday event promises to be a fantastic fun day out for all ages. "The main aim of the annual event is to encourage green-fingered folk of all abilities to swap seeds and seed potatoes but also to share tips and advice. Woodcraft and a talk by One Seed Forward. In a bid to encourage seed collecting, organisers of the event have distributed thousands of seed packets throughout the area which are free for keen gardeners to either start collecting plant seeds, or have already collected surplus seeds that they are willing to swap at the event. Free seed packets are available from the Aden Craft and Gift shop, Buchan Tools, Buchan Development Partnership, Aden Allotment Association or can be sent out directly from Buchan Development Partnership. Seedy Sundays will take place from 11am until 4pm. For more information about the event or to receive a seed packet please contact Buchan Development Partnership on 01771 613666.